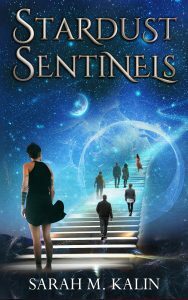 Debut novel “Stardust Sentinels”, by Sarah M. Kalin – to be released in the fall of 2019. Bex hated dreams. She was getting better at ignoring them, but if it was up to her the summer nights would pass peacefully without constant interruptions. So she wasn’t entirely displeased when she was recruited by the Stardust Sentinels to help guide dreamers at night. Now each night was filled with new adventures instead of her own thoughts. But life starts catching up with her and Bex must choose between doing what is easy or what is right. 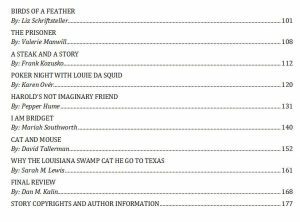 As part of the release promotion for our Bubble Off Plumb collection of short stories, we will periodically post sample stories from the book. We start off with a delightfully odd story by Buzz Dixon, “Barn Raising”. Details for our “Pin the Tale on the Editor” contest will be announced next week. It was quite a kick to prepare the contributing author print copy packages today. Plus the line at the post office wasn’t terrible either. Then sent emails with shipping details. It is always great to deliver good news! Details on the book found here. 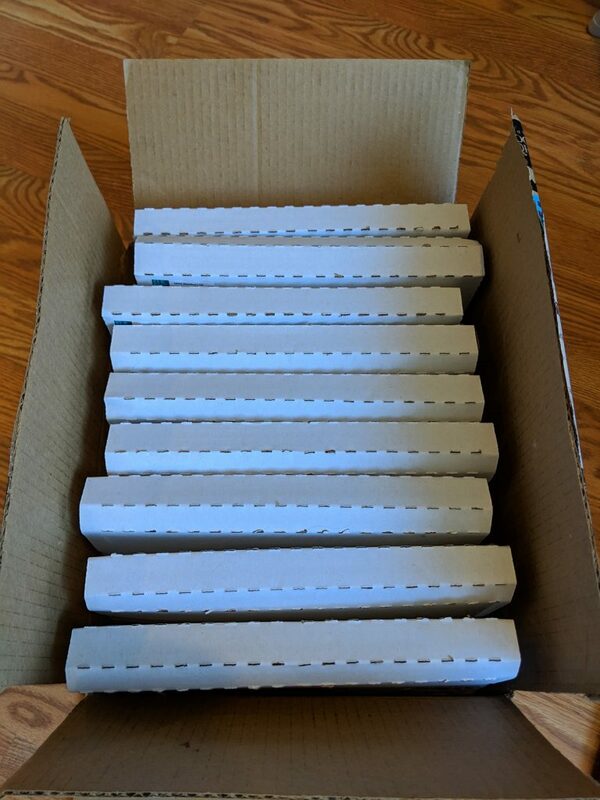 Guess what was just delivered? 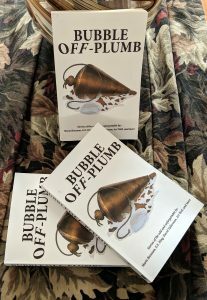 Good news, Bubble Off Plumb will be available in all formats by Friday, December 14th, 2018! We’re very pleased with the end result. 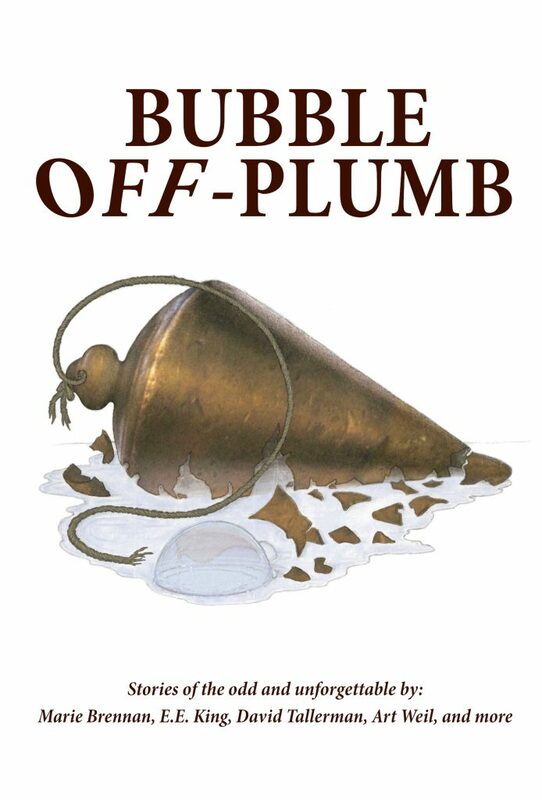 As an update, Bubble Off Plumb will be fully available by December 14th 2018. The ebook versions should be in most marketplaces as of this afternoon. We’re cutting a few corners on the print versions, in that only one source will have gotten a proof to us before the actual launch date. We have two sources for print versions and, since we felt it unlikely both would be flawed, considered it unnecessary to delay any further. We’ll post a sample story here in the next few days! 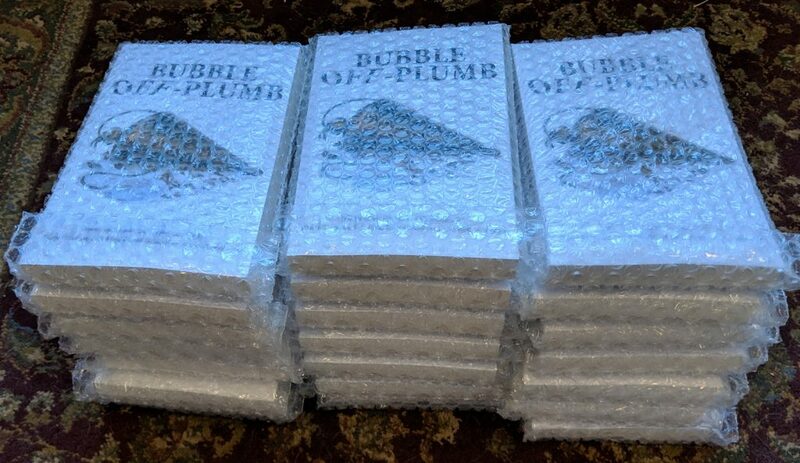 Bubble Off Plumb ebooks will be available for pre-orders on Amazon and Barnes & Noble no later than 11/30/2018. Release date is scheduled for 12/14/2018, which is when we expect to have paperback versions generally available. We will be covering the balance of the ebook distribution channels no later than 12/14/2018. 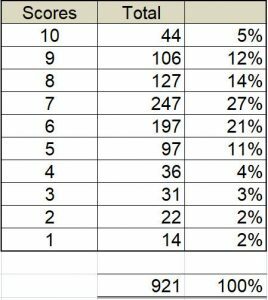 Keep in mind the manuscript page numbers are meaningless, it will change upon formatting for print. But this is the line-up and we’re really excited about the finished product. 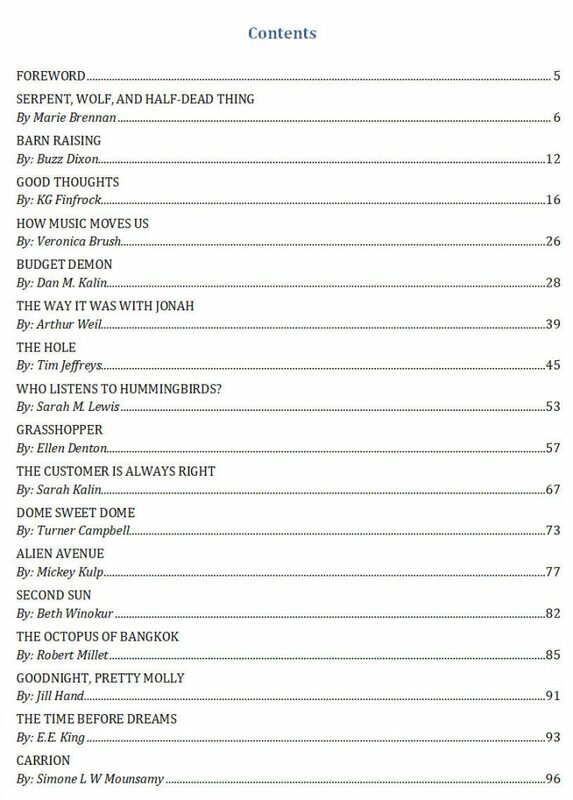 Our Bubble Off Plumb anthology has completed the editing process and is being formatted for print. We are targeting availability no later than the end of December. “What do stories about ephemeral Martian settlers, fascinating dimensional rifts, Spanish-speaking hummingbirds, Loki’s children, WWII twins, hitchhiking swamp cats, a steam-punk octopus, Arkham card-games, using bad luck for fun and profit, demon home security systems, alternative criminal justice, workplace time travel, marketing to body-snatchers, alien attraction, and way too many barns all have in common? Simple: in one way or another they are all Bubble Off Plumb. There may also be some illustrations, if the artist can render something exciting to enhance the stories in time. Stay tuned! Submissions for the Bubble Off Plumb anthology will be accepted through the end of today, September 30, 2018. The deciding qualification metric will be the email date-stamp our server assigns upon receipt, so please do not wait until the last minute. The BoP editorial team will make their story selections by 10/15/2018. Notices will be coming out as soon as possible thereafter. 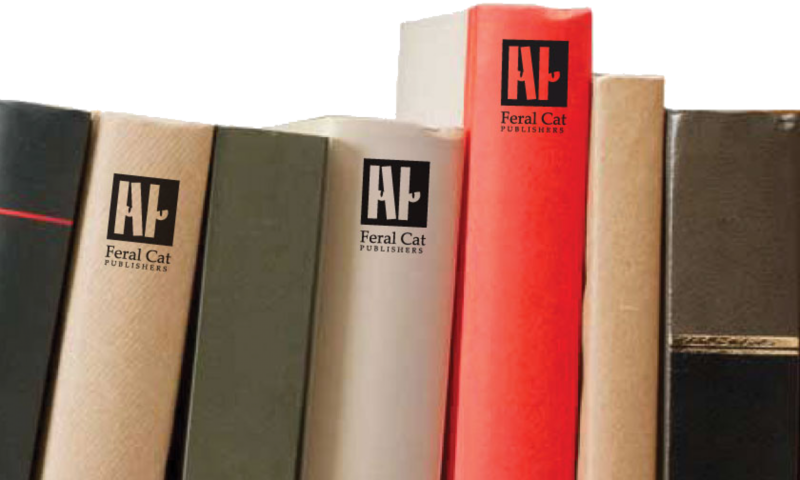 The response has been very gratifying and we’re looking forward to the homestretch to publication.